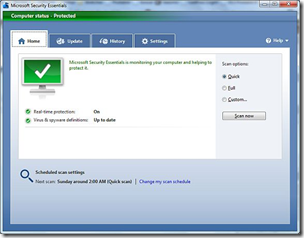 Last month Microsoft launched its free client anti-virus product, Microsoft Security Essentials (MSE). Early reviews have been positive and Readysellâ€™s internal testing has found the new application to be lightweight, simple to use and effective. The product is available for free for any user of a genuine copy of Windows XP, Windows Vista or the recently launched Windows 7. Readysell will be rolling this package out on all new desktop clients purchased from Readysell as well as any Readysell managed clients that have an expired security solution from CA or another vendor. If you would like to try out MSE yourself, it is available as a download directly from the Microsoft web site.